Tonight I made an extraordinary discovery: I confirmed the existence of a 'Share the Road' sign in Stamford. It's in the south end, not far from Exhale Spa. I was so transfixed I almost wanted to fall to my knees, gaze upon it and ask it to command me. Now I might not have made that extraordinary discovery had it not been for the extraordinary Bike Stamford, which successfully put more cyclists in one place at one time than I've ever seen in this city. As I wrote earlier this week: the ride was organized by Meg and Andrea and it was set up to be a polite, friendly non-Critical Mass ride. When I arrived tonight at the meeting point (Latham Park on the corner of Bedford and Prospect) twenty minutes early, there were already people showing up. Michael Fedele, the Republican candidate for mayor who I had the pleasure of riding a mile with in August, was there and said hello. He told me he regretted being unable to do the Bike Stamford ride himself, but did let me know that bike lanes were discussed at the AARP candidate forum this week. David Martin, the Democratic candidate who I also had an enjoyable ride with in September, also showed up with a couple of volunteers to do the Bike Stamford ride. A few members of People Friendly Stamford were there, and I also noticed Lindsay, a photographer from the Stamford Advocate and a News 12 cameraman. We started a bit late but no one seemed to mind. Meg and Andrea stepped up onto a picnic table to welcome everyone and explain the course. As she had said to me at the lunch, she stressed that it was a family friendly ride (pointing out a couple of children who were there) and it was "not a Critical Mass ride." I saw a lot of heads nodding and was thankful I wasn't the only one who understands that being rude on a bike isn't about you sticking it to some motorist today, but how that motorist will treat cyclists and cycling issues tomorrow. When we mounted up, I then took a step back and realized just how large the group was: it had to be more than sixty. At the corner of Bedford and Forest, right in front of the Avon Theater, we got into position. Now I know that this next picture does show cyclists taking up the entire lane. But please note: they are stopped at a red light (and Meg had told the group to stay in single file whenever possible). When the ride began, we mostly did stay in single file and two things impressed me: the riders I saw pedaled predictably…and the motorists mostly drove predictably too. I can't speak for everyone, but I talked to several riders later and we all agreed that Stamford motorists were on mostly good behavior. 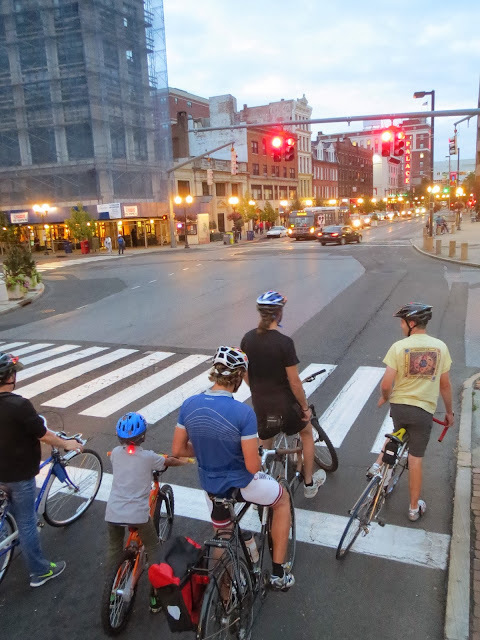 The whole Bike Stamford ride was what sharing the road should feel like…but often doesn't. I didn't even hear a car horn by RBS, which usually has a lot of BMWs and similar vehicles just streaming onto the I-95 on-ramp. However, it was now after six so we were on the tail end of rush hour. 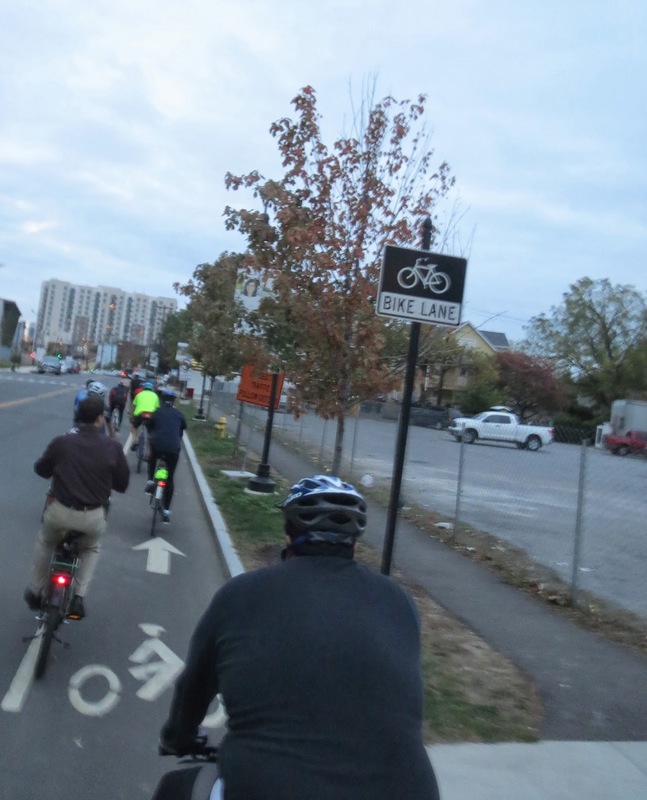 When we arrived at the south end, we suddenly had bike lanes before us. Unfortunately, cars were often parked on them. I wish they wouldn't do that. Maybe I could weld a homemade boot in my shop to put on the cars as a deterrent? Never mind. Yes, that white line on the right is where the bike lane is. Now it wasn't like that the whole way. In fact, not far from where this photo was taken was the Share the Road sign that nearly hypnotized me. Also exciting was the fact there were also sharrows (signs painted in the roads to remind motorists that, you know, cyclists exist). So was a bike lane that wasn't blocked by parked vehicles. Friends, citizens, candidates…lend me your eyes: paint is cheap and a little goes a long way to improving quality of life, attracting young people (millennials don't like/need/want cars like their parent's generation did) and reducing traffic congestion. The next person who is going to be mayor is reading this right now, so here I say this: doing this citywide needs to be high on any priority list. We snaked our way through the south end, passing Pacific Swim Bike Run - which just started their Columbus Day sale - and several curious people who looked as though they wanted to join us next time (some even said so). 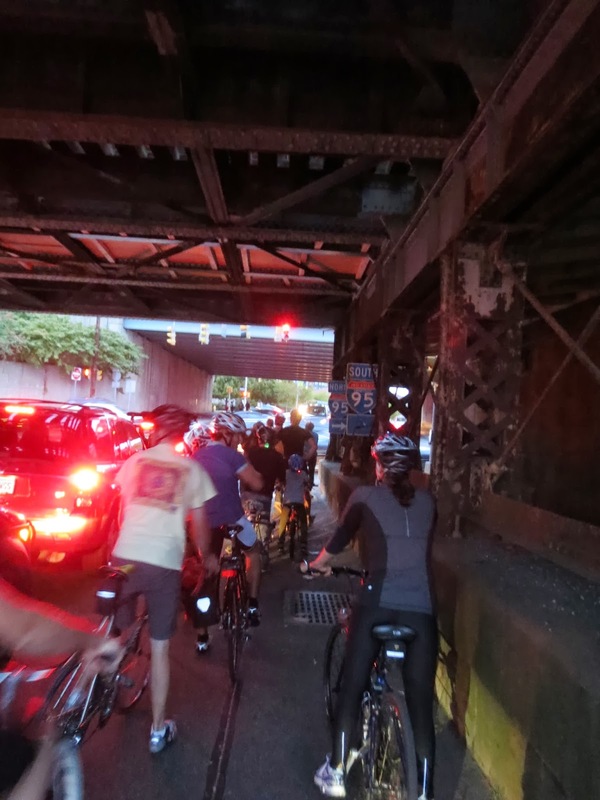 Eventually, the bike lanes disappeared entirely and we pedaled back under the Metro North tracks. This was a place to be wary since this is the sort of intersection that makes me think cars go through the light more when it is red as opposed to green. When the light did go green, we paused to make sure no one was running the red light the other way, and proceeded through safely. It was on Atlantic Street, on the way back to the park, when I began to realize just how dark it was getting. Fortunately, there were a lot of light colored clothing and blinking lights in our group. Back on Bedford, we found less congestion than we thought and moved back to the park, getting the attention of a lot of diners at the restaurants. Finally, we returned to Latham Park. 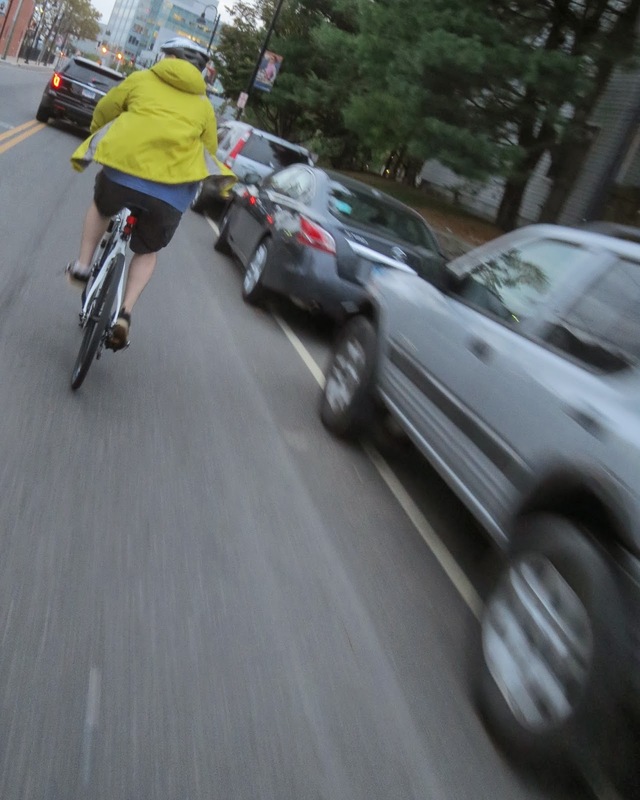 To be fair, this was the only time I heard car horns the entire ride: several of us were turning into the park and were forced to pick safety (getting off Forest Street so as not to be hit by cars turning right from Bedford behind us) over manners. At least one car on Forest waiting to get to Bedford honked. Motorist: whoever you are, I am sorry. I know you only had to wait a few more seconds, but if we waited on that narrow lane, we'd be inconveniencing more people longer. And if any of us were hit, you'd have to wait even longer than that. But I am sorry. Please support bike lanes and I hope you had a good Friday night. Once in the park, we waited for the rest of the riders - the red lights had broken us up into smaller groups through the ride - and talked about how much fun the ride was. 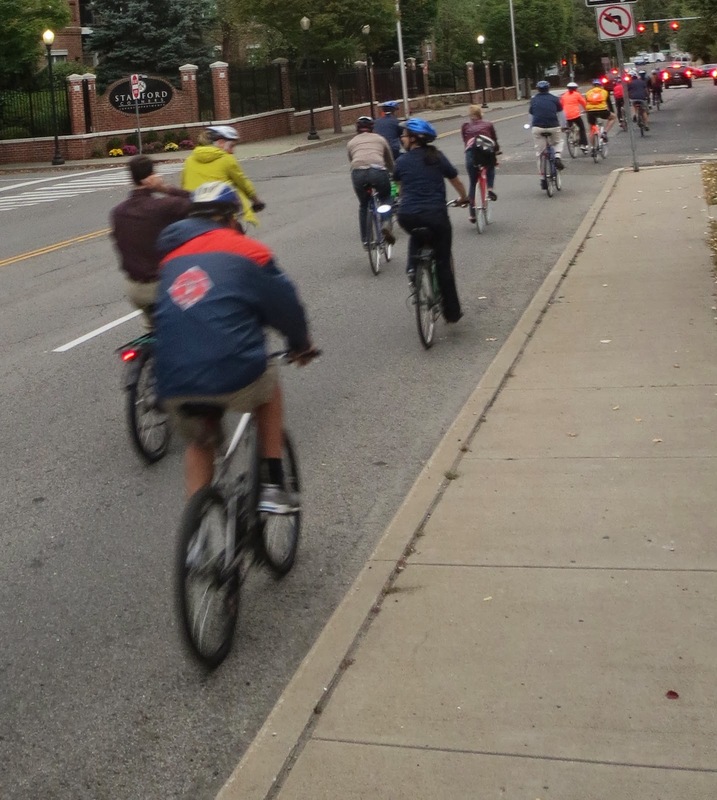 And it really was fun: riding with a large group of people in the city where I live and work is very much out of my wheelhouse. But people noticed us. Some were walking, some were sitting on stoops, but most were in cars. Maybe, just maybe, some of them realized that they too can choose the bike...and would be willing to help make this city work so it'll be easier for everyday people to make that choice. 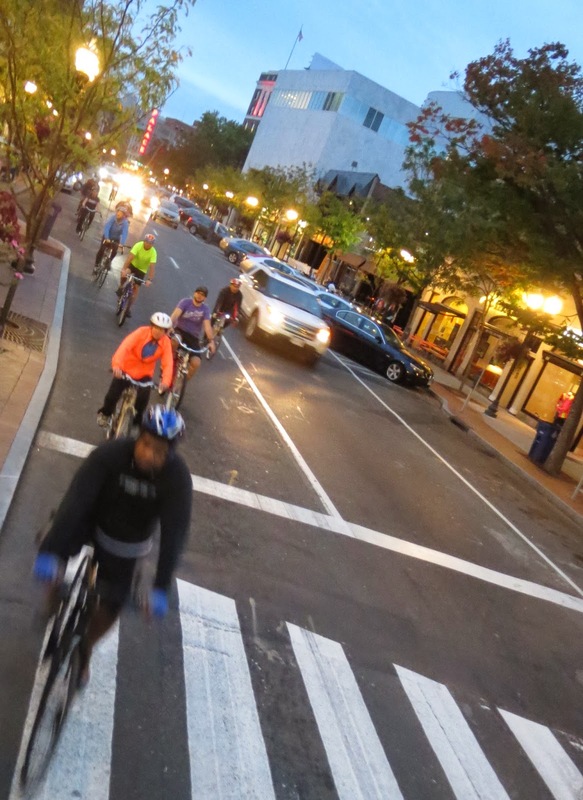 So Bike Stamford was a great ride, and I am sure there will be more, so follow Bike Stamford on Facebook. Also, if either Meg or Andrea ever asks you to take a bike ride with them, you say: yes. Thanks for reading and thanks for riding.